During February 2003 on diamond geezer I kept myself busy by counting things. Ten different counts, to be precise, in a none-too thrilling daily feature called The Count. My 28-day tally chart may have been deathly dull to the rest of you, but I've continued to count those categories again, every single February since, purely to keep tabs on how my life is changing. Fifteen years later, I can confirm it's changed quite a lot, not least because I no longer have a job, which ought to throw all previous patterns into disarray. Let's see if it has. Below are my counts for February 2018 (also available in graphical form via Daytum), accompanied by the previous statistics and some deep, meaningful pondering. Yes, I know February's not over yet, so all the figures below are based on best estimates for the final 24 hours. But don't worry, I'll come back and update the 2018 data as today plays out, before settling on the finalised figures at the end of the day. Count 1 (Blog visitors): It's been another good month for people turning up to read what I've written, indeed it's been the busiest February ever, having passed 2017's total two days ago. I'm averaging almost two and a half thousand visitors a day, which is as good as it's ever got, so I can't complain. 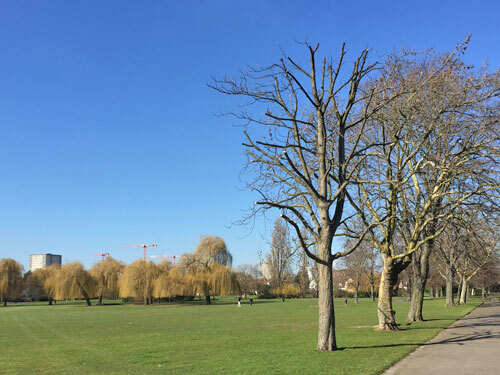 It amazes me sometimes that anyone comes back when there's the risk of reading about parks in Barking, castles in Warwickshire or another report from my local bus stop, which is hardly "must read" subject material for the average person in the street. But I do try to provide you with a varied diet where possible, rather than endless recycled press releases, because I believe there is still demand out there for original subject matter. It's not all high octane stuff here, not by a long chalk, as a whip round Tooting and a ride on the Woolwich Ferry will have confirmed. But as one of my regular twenty-five hundred, I assume you either keep coming back for the variety, or can put up with the personally-irrelevant stuff inbetween. Count 2 (Blog comments): There's nothing quite so unpredictable as comments. Some days this blog attracts hardly any, while other days the discussion catches fire and you add dozens. I'm pleased to report that this has been an extra-chatty month, with last year's record total being surpassed yesterday morning. Admittedly the best day for comments was the day I didn't post anything, and collective paranoia ran riot, but even without that entirely atypical boost the overall total is still impressive. Most blogs either no longer allow feedback or have commenting zones resembling tumbleweed, but somehow you lot always seem to carry on talking, nipping in with a pertinent reference, a pedantic query, a nostalgic nod, some schoolboy grandstanding or a bit of insider know-how. Admittedly it doesn't take much to set a few of you off, particularly if the topic is transport-related, and some days the gradient between sparkling and tedious can be steep. But one amazing statistic is that more than 300 different people have commented this month, chipping in when they have something relevant to say, and that variety is truly humbling. Somehow a community has evolved here, where regular and occasional commenters co-exist, and that's not an easy thing to create. Thanks everyone, because it's you that helps to bring this page to life. Count 3 (Blog content): At last I've curbed the inexorable upward trend in my output. The number of words in my posts has been creeping up since I started blogging, but this year the total has fallen back slightly (and would have done even if I'd not missed a day out). If it feels more, that's probably because I'm adding a few more photos than I used to, and those photos are a bit larger than they used to be. I confess I expected to be writing longer posts now that I have more time on my hands, but this has turned out not to be the case. I am however still averaging 1100 words a day, which is not to be sniffed at - it's the equivalent of writing five novels a year, except I never end up with a book to show for it. Count 5 (Nights out): Well that's unimpressive. After bumping up my nights out over the past few years, this year I've slipped back to my lowest total since 2007. Technically I am still going out on average once per week, but only if you include January 31st and March 1st, and for these tallying purposes they don't count. Also I've undertaken certain daytime meet-up jaunts over the last four weeks, but officially they don't count either. So all I'm able to include is one proper pub night, with multiple real people and beer, and two trips to BestMate's sofa, where we watched episodes of Black Mirror and put the world to rights. Must try harder. Count 6 (Alcohol intake): For the purposes of this long-term count, my definition of alcohol is a specific gassy bottle of German lager. I cling to Becks for familiarity and ease of ordering, plus it doesn't give me hiccups. But it's become increasingly hard to source on a night out, forcing me onto other riskier beverages, which my fellow drinkers tend to see as "a good thing". So you can imagine my delight when the only pub I went to in February actually stocked the stuff, and at a much lower price than the average London pint. It means my Becks count is a precise reflection of my public alcohol consumption this month, but also reflects the fact that my after-dark social life is minimal. At least my liver's pleased. Count 8 (Trains used): This count's normally remarkably consistent too... always just over a hundred a month. That's apart from the year when I had a "one train" commute rather than two, when the total dipped a bit, and apart from the year when I upped the total by blogging relentlessly about the Bakerloo line. I'm back in the zone again this year, averaging about four train journeys a day, because I'm still out there swanning around off-peak even though I no longer have to join the rush hour throng. Count 9 (Steps walked): I've been counting steps using the Moves app on my phone since 2013. It's a bit of a battery hog, and also potentially stalky because it records everywhere I go (both when and where), plus how I travelled inbetween. Alas last Friday it glitched for the first time and now crashes on start-up, so my most recent daily totals have had to be estimated. But I can confirm that this has been my fittest February yet, thanks mostly to daytrips to Bristol and Warwickshire where I walked over thirty thousand steps each time. Working days used to mean consistent steppage, but not working has allowed me to ramble more, and I'm proud to have walked over 100 miles this month. That said, if anyone knows of a reliable iPhone tracking app, I fear I may now be in need of one. Count 10 (Mystery count): Sorry to disappoint you all, again, but the legendary diamond geezer Mystery Count continues to be nil. I know, I'm as unimpressed about the outcome as you are. And best not get your hopes up for 2019, this big fat mystery zero is seemingly here to stay. 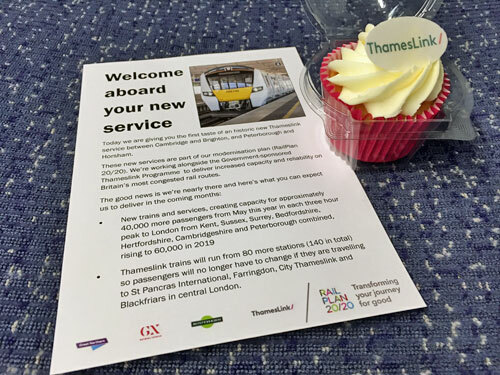 If you caught the right train yesterday, you'd have been given a free cupcake to celebrate a railway opening 18 years late. Thameslink 2000, now known as the Thameslink Programme, is a 20th century plan to link various destinations north of the Thames with various destinations south using tunnels from St Pancras to Blackfriars. 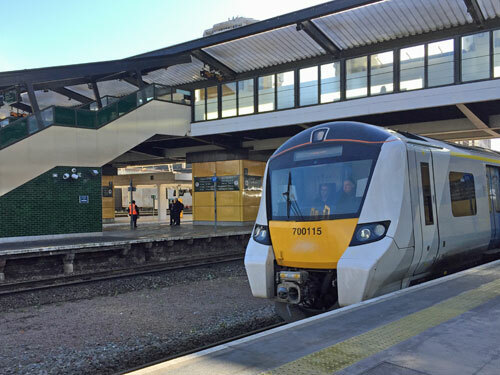 It's been possible to go from Bedford to Brighton since 1988, but the remaining connections required knocking down bits of Borough Market, completely redeveloping London Bridge station, and billions of pounds of other upgrades. Final completion won't be until December 2019, but the major timetable change is this May, and the first so-called 'preview services' ran yesterday. Key to all this are the Canal Tunnels, which link the East Coast Main Line to the Thameslink core. They do this by dipping underneath the Regents Canal, and were actually dug way back in 2006 as part of Eurostar's realignment. I took a ride on the first passenger train to pass through. I didn't go all the way out to Peterborough, I hopped on at the first stop in London, which was Finsbury Park. You could tell something was up because there were rather more Thameslink staff on the platform than usual, some holding large cardboard boxes labelled 'Fragile'. You could also tell something was up because the Men Who like Railways were here, specifically the Post-Retirement branch (n.b. Women Who Like Railways oddly failed to show). They clustered and chatted, or tried to get decent shots of the train arriving as proof of conquest, and in it rolled bang on time. A train from Finsbury Park direct to Gatwick Airport, how very exciting. It wasn't busy either, as you might expect on a Monday morning with only a sprinkling of publicity, so the train had plenty of seats to go round. That is except in the front carriage, where most of the MWLR had assembled, and who were showing up on the Train Loading Display as minor overcrowding. Perhaps they weren't keen on sitting down. The seats in these new 12-carriage trains have been likened to ironing boards - hardly ideal if you're making the full three-hour journey, but allowing plenty of standing room for rush hour short-hop commuters. The first tunnel, south of Arsenal's stadium, is not the new one, which comes a minute later as the train veers off the mainline and starts its descent. Once you're inside the tunnel there's little to report, everything being dark... just the sensation of going down, and curving round, and gently climbing on the other side. 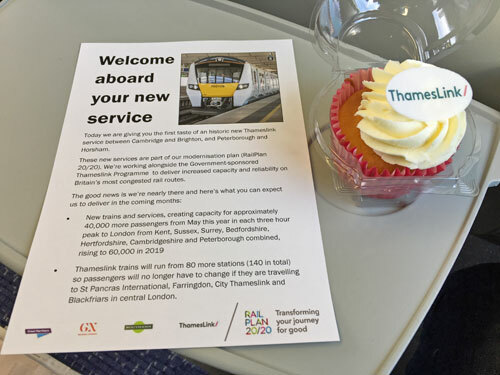 Thameslink staff improved the experience on this occasion by walking down the aisle and dispensing Fragile branded cupcakes, plus a leaflet which they knew half of us would read if it came with free sugar. Your future rush hour experience will not come with smiles and gifts. The driver then wrecked the ambience by announcing that we were being held at a red signal while waiting for a free platform at St Pancras. I suspect this is going to be a familiar refrain in the future, as Thameslink gears up to sending one train every 2½ minutes down this central core. The fact that we waited there and still arrived into St Pancras a minute and a half early explains how this magical train-squeezing trick is going to be performed, namely over-generous timetabling. It may also come as a shock to some passengers used to arriving and departing from Kings Cross to suddenly discover that St Pancras is the place to be instead. On we sped to Farringdon, then City Thameslink, then Blackfriars. This bit isn't new, it's 20 years old, but rolling out onto the platforms midriver at Blackfriars is always impressive. The next bit is new, however, or at least has been upgraded to cope with the full flow of two-way traffic now expected. For the last few years all Thameslink trains have been diverted south via Loughborough Junction on a tediously slow wiggle through south London. Yesterday we were finally able to turn left and trundle high across Southwark before crossing the old bridge over Borough Market, at long last renewing the connection to London Bridge. We arrived on platform 4, which wasn't previously accessible when London Bridge was relaunched in January. A second Thameslink train pulled in alongside on platform 5, ditto, on its way from Horsham back to Peterborough. It was due to be the second train through the new Canal Tunnels, so a lot of the MWLR hopped out and clambered on for the return journey. I decided to stay on to East Croydon, via New Cross Gate and Norwood Junction, enjoying the faster route and the remnants of my cupcake. And then I did a quick bit of shopping in the Whitgift Centre, before catching the third train on the way back. A quick word about what's going on. These are 'preview services', designed to give passengers a flavour of what's going on, and drivers and staff a chance to practise the new routes. There are only six preview services a day. Four trains run between Peterborough and Horsham, and two between Brighton and Cambridge. Half the trains run north, and half south. They only run on weekdays at present, avoiding rush hours. Other trains have been nudged around the timetable slightly to make way. You can see the timetable, and read more information, here. Cambridge has never popped up on the destination board at East Croydon before, but there it is. Unfortunately the train to it is currently running late, for which the automated announcer duly apologises. The train is also rather busy, having rolled in from Brighton via Gatwick Airport with all the luggage that entails. In the description which follows I'm going to focus specifically on timing, because this may prove to be the bête noire of the new Thameslink core. The majority of passengers alight at London Bridge, because up until yesterday that's where their train would have terminated. Those who stay aboard are perhaps surprised to hear the driver announce "we're running a little bit early" and aren't due to depart until 12:49. 12:49 is twelve minutes away! How can we have been seven minutes late at East Croydon, but are now twelve minutes early. The answer is creative timetabling, indeed if we'd arrived on time we'd have been sitting here for a full 17 minutes. Some devil has scheduled an extra-long layover to ensure that we're definitely going to be in place to depart 'on time', and if that means passengers sitting around for ages so be it. It won't be the case that all future Thameslink services do this, but all three northbound preview services have acres of padding, so when the driver said "we're running a little bit early" he was telling a fat white lie. We leave on time. We nearly reach Blackfriars in 2 minutes, but instead we sit outside at a red signal while a train to Bedford overtakes us on the other line. This is the train which left Brighton 3 minutes after our train, but is timetabled to arrive into Blackfriars 3 minutes before ours, despite stopping more often. This is timetabled devilry, deliberately introduced to improve the reliability of the service, and to slot us into the right gap in the schedules heading north. We arrive at Blackfriars two minutes late. We arrive at City Thameslink two minutes late. We arrive at Farringdon one minute late. But we arrive at St Pancras one minute early, thanks to the padding in the timetable, and we depart bang on time. Shuffle trains slowly enough through the central section and you can almost ensure they'll be punctual by the time they come out the other end. 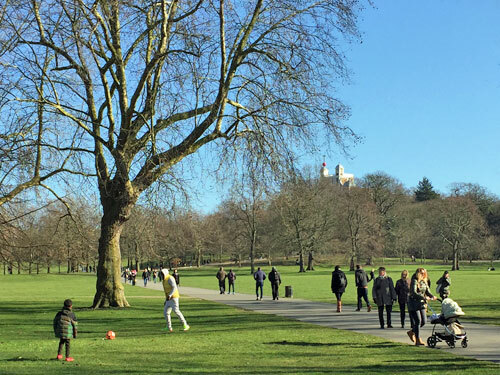 On a crisp winter's afternoon, what better than a walk round a park? So yesterday I went to three parks and walked round each of them. Specifically I went to three London parks whose names begin with 'Gre', and walked clockwise around the perimeter. What better? The sky is a sharp blue. Outside the exit from the tube station a violinist is playing an excerpt from The Four Seasons. Inexplicably he has chosen Spring. Three hotel staff have popped out of the back of the Ritz for a smoke. Only the bravest daffodils have burst into full flower, perhaps one in a thousand. Maybe by next weekend they'll be a-dazzle. Two small children kick a football through the nodding stalks. Cameras look down from the back of Spencer House. Milkmaids Passage is firmly locked. Many of those passing through are in their winter finest, designer scarves neatly tied. Some carry branded cups, others dangle bags from Fortnums, Peggy Porschen or M&Ms World. 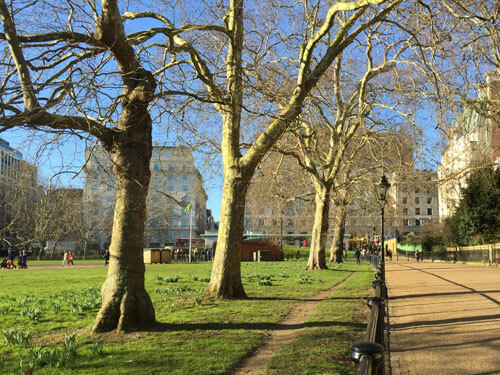 Signs remind visitors that this is "The" Green Park. Feeding pigeons is not permitted. The flying of drones or model aircraft is prohibited. Deckchairs will return in April. A police car is parked up at the foot of The Mall keeping an eye on the absence of Sunday traffic. The golden gates facing Buckingham Palace glint in the sun. Hordes are swanning down Constitution Hill, giving Green Park a miss after overdosing on Hyde instead. Listen carefully and French, Russian and English can be heard, amongst other tongues. Stood outside the lower kiosk are clusters of cycle hire riders clutching hot drinks. Avenues of London plane and lime stretch up to Piccadilly. On the slopes of the central wooded mound a photographer has found an open trumpet and is crouched down in front of it. The view towards the line of benches is better than the view from them. An empty bottle of M&S Merlot has been abandoned against the trunk of a tree. The Queen's Meadow is roped off, seeded with wild flowers from Horsenden Hill. A smart young man is inside the Bomber Command Memorial, keeping out of the wind while making a very long phone call. A less smart young man thrusts by on a red scooter. The perimeter path wiggles and dips just enough to be interesting. The violinist has moved on to album-era easy listening, and now has a few more coins in his case. The sky is a sharp blue. The gates to the park are narrow, and a crocodile of prams, pushchairs and tricycles trickles through. Some bloke has turned up with a bucket of detergent and a bubble-blowing wand, to the delight of a small girl in a pink anorak. The National Maritime Museum urges passers-by to consider its royal exhibition and its scrumptious cakes. On an adjacent bench an ear-muffed lady is picking over an avocado in a plastic tray. This is the best time of the year to cycle aimlessly around the drained boating lake. Two teenagers have been practising tricks by the Millennium Sundial, and stop to review their video footage before uploading. Fewer people walk up the edge of the park than across the middle. Joggers tackle the hill climb with panting resignation. Some visitors have brought their families, others their dogs, several both. Wolfhounds lead their owners towards the Observatory, labradors explore tree trunks, and terriers waddle by in thermal coats. Just one tree has burst out into glorious pink blossom. Squirrels pose for photos in the Flower Garden beside roped-off pansies. A retired couple pause to listen to birdsong, before two nattering friends frighten the performers away. Where viewing permits, two stags can be seen in the enclosure shoving logs around with their antlers. Although the park is buzzing, the southwest corner is almost silent. Next summer's cricket screens have been stashed away against the far wall. Every bush in the Rose Garden has been decisively pruned back to a uniform height. Each of the benches around the circumference is occupied by well-wrapped souls soaking in the sun. Only one person is on the tennis courts, playing against themselves with the aid of a sloping wall. The burgeoning towers of Docklands dominate the view from the top of the escarpment. Woolly hats with jaunty stripes and fluffy bobbles are very much the fashion atop promenading couples. The bloke with the bucket is still blowing bubbles, but now to a smaller audience. The sky is a sharp blue. The sign at the gate opposite Londis welcomes visitors with a map and the byelaws in pictorial form. Alongside is an angled bed of stunted shrubbery with a geometric ring of pebbles in the centre. As expected, the public toilets are firmly padlocked. A Victorian-style carriage road runs around the perimeter, and has done since 1926. A local dad arrives with two daughters and a newly-bought kite, which they unwrap and then tug aloft, tiger tails flapping in the Siberian easterlies. Two youths in market-bought anoraks, hoods up, wander in and cut across the grass. A sparrow pokes around in the borders. Dozens of empty peanut kernels litter the periphery of a bench. At the next bench an old man in a plaid coat is sat flicking through the Sunday Express, a can of Special Brew in his hand, and a pack of twelve unopened at his side. He's here for the long haul. Five kids come running through the ornamental gardens, Mum following on behind, swarming towards the play equipment corralled on the far side. A dogwalking lady smiles by, talking East European into her phone. The tennis courts are vacant. There are already daisies in the lawn. 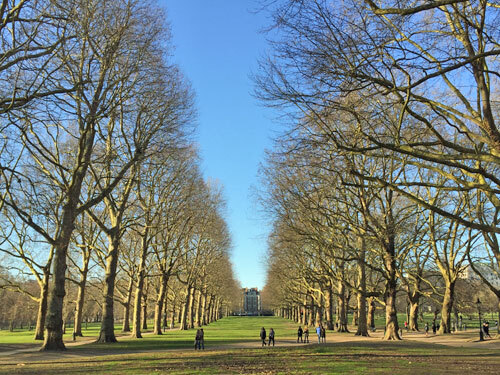 All the trees down the central avenue, dividing the pretty half of the park from the running-around half, have wispier droopier branches than the plane trees around the edge. The A13 dual carriageway speeds past behind the railings, between the fire station and the Movers Lane flyover. A pollution monitor stands sentinel beside the southern gate. None of the daffodils are open yet, but one purple crocus is showing the way. Resting on a felled trunk, a young lady entertains her micro-dog with the aid of chucked twigs and hurled branches. On the eastern edge the main path meanders around a platform of crazy-paved beds, where a bench is dedicated to a Very Special Citizen of Barking, Annie Clara Huggett, 1892-1995. The roses may be splendid later. All is well-maintained and attractive, tended by unseen hands. Even in winter, parks are the mainstay of the suburbs. TfL fares are bloody complicated. What with zones, caps, Pay As You Go, Travelcards, peak, off-peak and cash fares, plus the annoying niggle that some lines cost more than others, it's a wonder anyone knows how much a journey's going to cost. Indeed, TfL no longer explicitly state what their fare structure is, preferring to focus solely on capping instead. They used to publish leaflets, and embed fare tables on the website, but these days there isn't even a pdf to show how much a single journey costs. Instead there's a Single Fare Finder online, where you type in where you're going and it tells you the price, but if you want the overall picture of what's going on, that's all concealed. The only place such information ever crops up is on the Mayor's website, hidden in an appendix to the annual fare increase announcement, and which daily traveller is ever going to think to look there? So I thought I'd unpick the fare for a single tube journey, given that TfL won't, and show how simple things are underneath. So that's easy. If your tube journey is only in zone 1, it always costs £2.40. And that's very much what you'd expect. If your peak time journey includes zone 1, it costs more for every extra zone it extends into. Generally it costs about 40p-50p extra, although there's a 60p leap from Z3 to Z4, and an 80p leap from Z4 to Z5. Commuters from zone 5, sorry, you're the losers here. That may be simpler than you expected. This is because, off-peak, there are only three fare bands. A Z1-2 journey costs the same as a Z1 journey, a Z1-4 journey costs the same as a Z1-3 journey, and a Z1-6 journey costs the same as a Z1-5 journey. Essentially, you're getting an extension into the even-numbered zones for free. For example, if you travel from King's Cross to Acton Town (Z3) on the Piccadilly line, it won't cost you a penny extra to continue to Hounslow Central (Z4). For another example, if you get on the tube at Covent Garden and go one stop to Leicester Square, that's always going to cost you £2.40. But off-peak you could have gone all the way to Stratford for £2.40, or Hammersmith, or Hampstead, or Brixton, at no additional cost. Journeys which stay outside zone 1 cost less. Even at peak times, a two-zone journey (e.g. Z4-5) costs only £1.70, and a five-zone journey (i.e. Z2-6) costs only £2.80. That's a bargain, relatively speaking. As an example, if you were heading in from Heathrow on the Piccadilly line in the rush hour, then getting off at Earl's Court would only cost you £2.80, but staying on one more stop to Gloucester Road would set you back £5.10 (a whole £2.30 extra). I wonder how many travellers realise the cliff edge is that steep. And this is the tube's biggest bargain. Any off-peak journey which stays outside zone 1 only ever costs £1.50. This includes hundreds of different possible journeys around the London suburbs. This is excellent. This is also why it's important to swipe the pink readers if you're making a journey around London, to tell TfL that you didn't go anywhere near the centre, and should therefore only pay £1.50. Not swiping pink, where appropriate, can be an expensive error. As Geoff recently demonstrated, even a journey from Heathrow to Upminster only costs £1.50 if you're willing to go the long way round. ...and that's it. That's the full extent of tube fare structures within zones 1-6. There are only a dozen different basic fares, and none of them will be changing before 2020. Simple. It stops being simple as soon as you nudge into zone 7, or get the Overground out of Liverpool Street, or use TfL Rail, or catch a 'train' rather than a tube. I believe it's also simple if you make a return journey - it's always double the fare shown here. But once you make several journeys, or throw in a bus ride, then daily caps start kicking in and it gets much more complex. Let's not go there today. Fares shouldn't need to be hidden, just because some of them are complicated. But because not all single journeys are this straight-forward, it seems TfL prefers to reveal nothing at all. 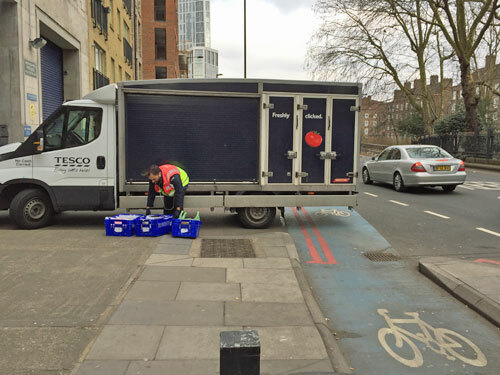 This was the scene in Bow yesterday as a Tesco delivery driver parked up to unload groceries, blocking the Cycle Superhighway. Have you seen this kind of obstruction on your travels? Is this kind of behaviour on the rise? Have you ever contributed to it? What do you think? Last summer Lonely Planet described Tooting as one of The World's 10 Coolest Neighbourhoods To Visit Right Now. Having been for a visit, I can confirm that their grasp of reality is weak. That said, all their trendy recommendations lie close to Tooting Broadway tube station, and I'd headed to the area around ordinary Tooting instead. 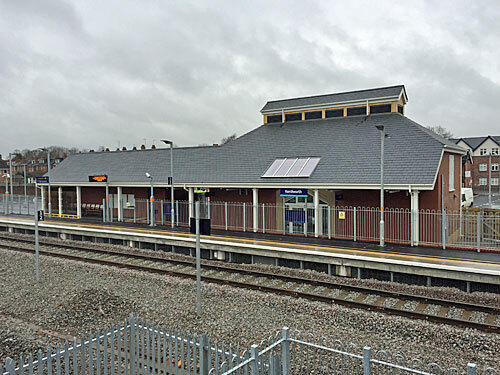 This is a Thameslink station on the Sutton loop, a backwater service whose trains run twice an hour rather than the Northern line's regular torrent. Join me as I wander the local backstreets on a hunt for something slightly interesting. 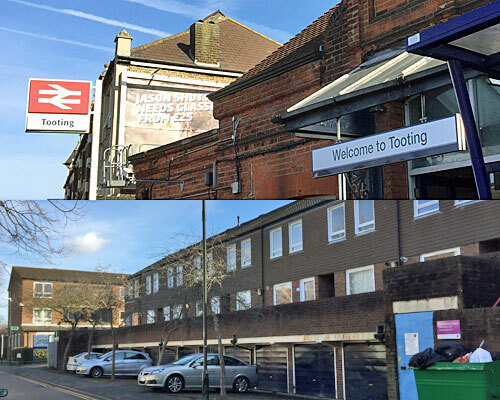 Tooting station used to be Tooting Junction, back when a separate line (the Tooting, Merton and Wimbledon Railway) branched off here from here towards Wimbledon via Merton. The station was originally on the other side of the road, with four platforms, until nudged east past the junction, with two. The original station's skeletal footbridge sort-of survives, just beyond Lidl, connecting to a dour footpath following the line of the former railway. More comprehensive railway infill has been provided by Singleton Close, a twisted cul-de-sac of postwar housing sandwiched into what was once a trackside goods yard. Its flats are drab three-storey blocks with rows of garages underneath, and courtyards now fenced off with buzzered gates to restrict miscreants and ne'erdowells. Known today as the Abbey Orchard Estate, after a fruity farm corner long since felled, its lacklustre ambience destroys Lonely Planet's claim almost single-handed. As you might imagine, this is a cemetery on London Road. It's of 1929 vintage, so not especially characterful or topply, but smartly laid out around a small symmetrical chapel, and with an enclave of Commonwealth War Graves dead centre. It's also one of the most colourful cemeteries I've ever visited, which may be down to the fact that displays of artificial flowers are permitted, or is due to the presence of florist Caroline in her trailer outside the front gate, all major credit cards accepted. More graves than I expected were smothered with bouquets, tributes and family names spelt out in floral letters... or perhaps that's just London in the winter. 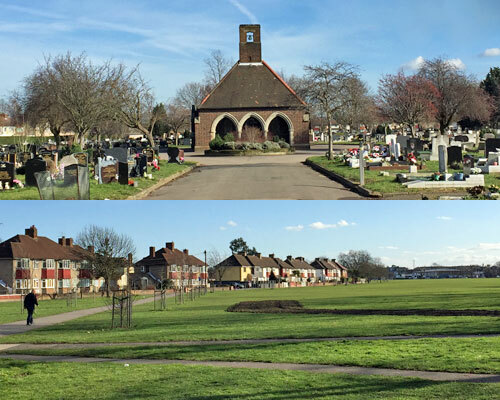 The long triangle of grass opposite the cemetery, stretching way down to Mitcham, is called Figges Marsh. It's no longer a marsh, but probably was in 1357 when farmer William Figge owned the land. Various tales are told of Figges Marsh in days of yore, few of them certifiably true. It'd be good for a kickabout - jumpers for goalposts required - but too muddy for anything resembling a picnic at present. Other locations on Lonely Planet's cool list include Lisbon, Seattle and Kuala Lumpur, which may just have the edge here. Furzedown would be a better known London suburb if it had a station, or if people paid more attention to where the Mayor actually lives. It rises up the hillside towards Tooting Bec, engulfing the land belonging to what was once Furzedown House, an attractive Georgian mansion. 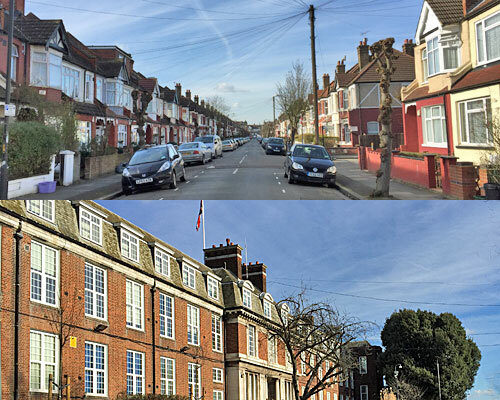 Although none of its glasshouses or fishponds survive, the house itself lingered on as a Teacher Training College and now forms the nucleus of Graveney School, one of Wandsworth's premier secondaries. I couldn't see much of the old bit from the road, but my word, the concrete accommodation block alongside is proper ugly. 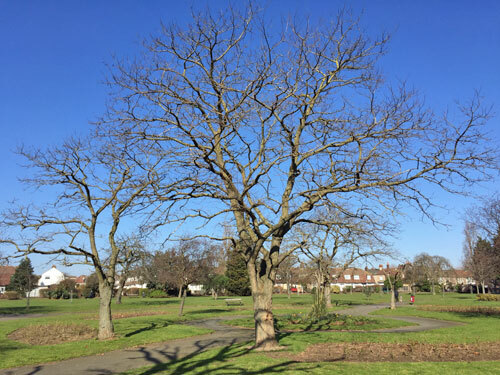 Admittedly Tooting Bec Common is mentioned in Lonely Planet's citation, but not the thin strip along the southern edge which is the only bit in Tooting station's sphere of influence. 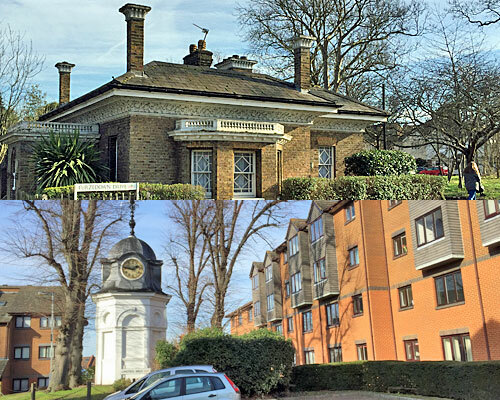 Here we find what used to be the Lodge of Furzedown House, at the top of a road still called Furzedown Drive, and a sign listing the byelaws on Tooting Commons, and a footpath so muddy that my trainers regretted it for the rest of the day. Don't come to these edgelands specially, go to the proper bit. Taking a shortcut through an 80s estate off Rectory Road I was surprised to find a clocktower plonked in the central courtyard, and a lone portico dumped at the end of the lawn. Subsequent digging revealed that this used to be the site of St Joseph's Roman Catholic College, which in 1897 became the Tooting Home workhouse for Wandsworth's "deserving old and infirm", then during WW1 a military hospital, and later a hospital caring for the chronic sick. Massive it was, and all of it levelled in 1981 apart from that cupola brought down from the roof. The current residents of the St Benedict's Estate seem mostly intent on telling other people to go away (Residents Parking Only, No Dogs, Non-Residents Will Be Clamped), with the "This Is A No Cold Calling Zone" sign attached immediately in front of the clock a particularly parochial touch. If anywhere round here was going to thrill Lonely Planet's lifestyle journalists, it would be the main road bending round from Tooting Broadway. 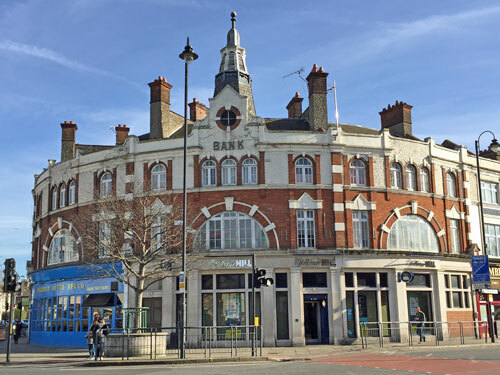 Unaccountably they weren't thrilled by the Afghan Palace, or Chicken Circle, or Pizzeria Sette Bello, let alone the William Hill where Barclays Bank used to be. They did like the Little Bar, a little bar on Mitcham Road, but again that's fractionally inside the wrong hinterland. I worry sometimes that this Random Station project might not be all it's cut out to be. With the arrival of Crossrail now just ten months away, TfL's commercial development arm has launched exciting new plans to maximise brand-led revenue potential. 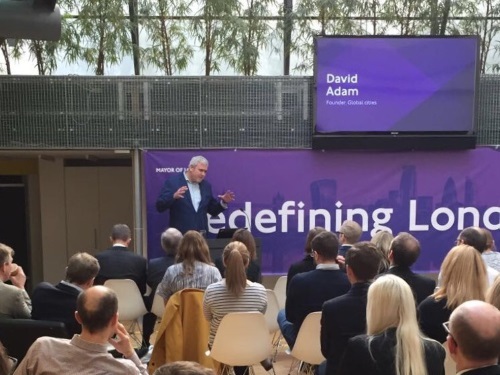 This week saw the starting pistol fired on a tender process for commercial partners, offering brands a unique opportunity to align with the historic launch of Crossrail later this year. The campaign is based around the strapline that the new railway will 'redefine London', as TfL's fresh approach simultaneously redefines best practice in premium integrated advertising. The launch of the new line offers "an unmatched opportunity for brands to be part of a historic moment for our city", according to TfL's Head of Marketplace Engagement, Graeme Craig. Crossrail will launch in December 2018 with a family of exclusive brand partners - this is your chance to be one of them. 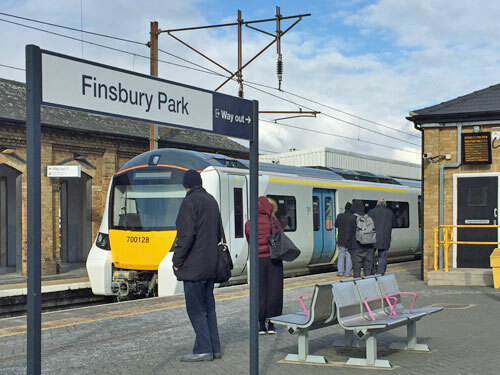 Just six partners will have complete sector exclusivity across the entire line for the inaugural 12-month period, enjoying full priority leverage in TfL's marketing and promotional activity. Every single advert you see on Crossrail in its first year will feature the brand messages of these paid-for ambassadors, and absolutely no other companies whatsoever. These will be London's Ultimate Influencers, truly Six Of The Best, and I am so going to be one of them. I see no reason why diamond geezer should not be a trusted business partner for Crossrail's first year. Audi are welcome to the car sector, and HSBC can be the banking overlords, but I'm 110% certain I have the gritty commercial nous to be the industry-leading Launch Partner for Media and Information. I've been reporting on the development of the new line for 15 years, and my relentless promotion of the Crossrail name means I'm nothing less than always on brand. 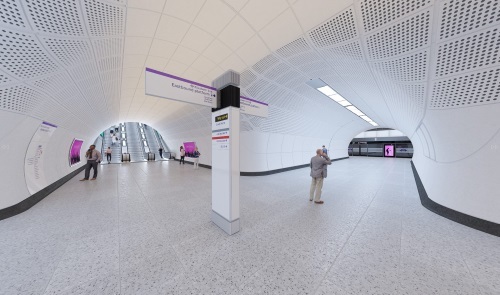 Crossrail stations have been specially designed to embrace state-of-the-art advertising, which will be positioned only where it will be most effective and impactful, thereby maximising experiential cut-through. Escalators will be embraced by sleek digital ribbons, passageways will be uncluttered except by ultra-HD LCD screens, and platform doors will include embedded advertising panels showcasing animated brand messages. The aim is that premium infrastructure and full-motion capability will deliver unequalled levels of engagement within an ultra-immersive environment, and I for one cannot wait to see the diamond geezer brand message absorbed by a savvy global audience. A couple of weeks ago TfL invited all of us prospective bidders to a Showcase Event at their new offices in the Olympic Park. It was exhilarating to be in the presence of such esteemed operators as Google, Samsung, Lloyds, BT and Cadbury, but also slightly terrifying, as these are my Crossrail nemeses. The team from Burberry seemed confident they had what it takes to be Launch Partner for High End Fashion, while the Amazon crew queried whether they might be allowed to bid for more than one of the six openings, given that they have their fingers in every sector. As well as nibbles, and the chance to meet with TfL royalty, we delegates were treated to a thrilling Virtual Reality experience depicting a fly-through of potential in-station locational opportunities. Thanks to the wonders of YouTube you can watch that very presentation here, except in 2D, and without the need for plastic goggles clamped to your face. 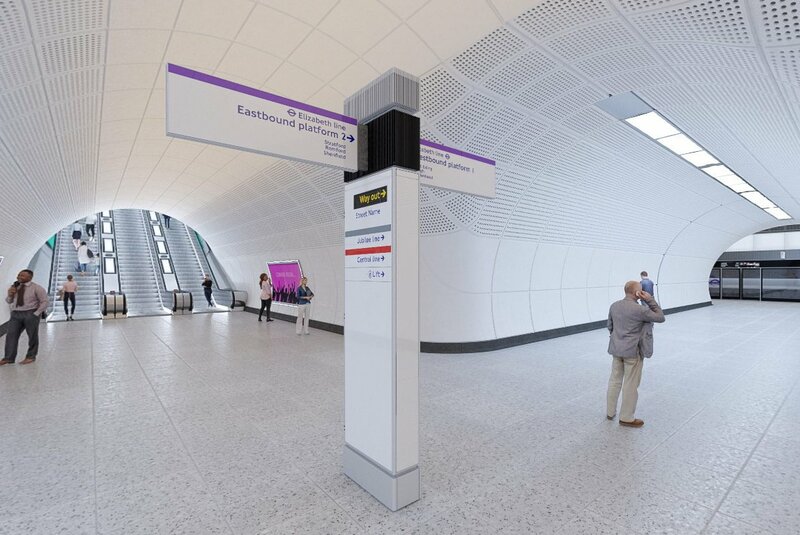 We were all filled with surprise and delight when we saw Crossrail's streamlined concourses, scattered with inquisitive customers peering at glowing mauve rectangles, alongside totem-pole signage directing passengers to their platforms. Just look at how minimalist the advertising estate will be, and thus how prominent each digital intervention will appear. I know that the digital screens all appear somewhat tame in the video, but that's because TfL have used muted silhouettes rather than full-colour eyeball-gouging histrionics, and in reality it'll be much more obvious. Imagine the thrill of scrolling through my blog on a high definition cross-passage screen, or being able to enjoy my video of London's Best Secret Daffodils on endless loop. The chance to drill down and dominate a single Crossrail station is an especially exciting aspect of the project. My plans to temporarily rename Farringdon as Diamond Garden, in partnership with a local Hatton Garden jeweller, are already at an advanced stage. I have Valentine's Day 2019 pencilled in for a Big Sparkler Giveaway, midsummer earmarked for a women's car insurance promotion, and am planning an immersive marketing tie-up with Netflix for the launch of the second series of Altered Carbon. But what's really got me salivating is this unrivalled opportunity. It's long been a dream of mine to force my blog onto the iconic tube map, even though it doesn't deserve to be there. And now, thanks to TfL's escalating budgetary shortcomings, my prayers have been answered. From December 2018 onwards, every time you pick up a tube map in a station, or download a graphic online, I'll be there in the corner. My brand presence will stand astride the Capital, in logo form, subliminally reminding millions to check out the latest blogpost every morning. I'm hoping to grab the pre-eminent position between Epping and Shenfield, rather than being sidelined to the back cover below the index, but will make do with disfiguring New Addington if pushed. If nothing else, I need to get myself onto this map simply so that Emirates doesn't shoehorn itself into the capital's transport mindset any more than it has already. But I still have hurdles to overcome, the first of which is money. The minimum bid to become a Crossrail Launch Partner is £6.5m, which admittedly sounds steep, but could easily be achieved if every Londoner donated a mere £1 to my campaign. I'm convinced that this total is achievable, and will be launching my "Dig For Diamond" crowdfunding platform next month. Please give generously - even 75p will help if you can't afford the full pound. It's in my favour that the highest bid won't always win. TfL have made it clear that financial considerations will account for only 80% of the decision, with "passion and vision for the project" counting for 15% of the score and "how much you want to alter the contract" for the remaining 5%. I'm convinced that my creative ideas, dynamically expressed, will be more than a match for whatever Vodafone, Facebook or BMW think they can cobble together. The tendering process closes on 23 April, with submissions reviewed by TfL between April and May. But it won't be until October that the winning brands will be announced, at which point I'm certain that diamond geezer will be catapulted to global prominence as a trusted media partner. Watch out for the blog exploding all over Crossrail from December, as London's newest railway becomes all about me, me, me, because I've paid for the privilege. Some castles still stand in their entirety. Kenilworth isn't one of those. Some castles are romantic ruins and little more. Kenilworth isn't one of those either. It does have plenty of knocked-down bits, but crucially also several surviving walls and bits of towers, which is great because nothing beats a genuine medieval spiral staircase. 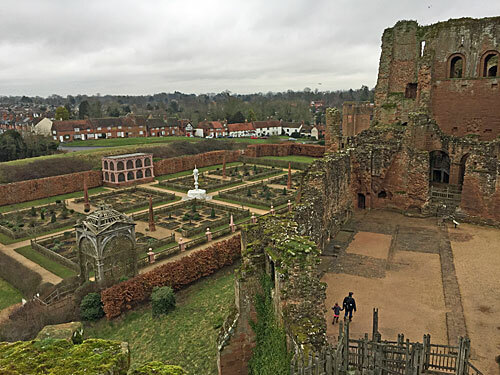 Kenilworth's a Norman castle enlarged by King John, enlarged further by John of Gaunt, and generally poshed-up by the would-be husband of Queen Elizabeth I. It'll have cropped up in your history books more than once at school. But 500 years of importance came to an end when the Roundheads slighted it, and these days the worst altercations it sees involve pint-size knights on a half-term rampage. The castle's on the edge of town, a good twenty minutes walk from the station, and ten from the Bus Focal Point. The most interesting way to get there on foot is across the Abbey Fields, where a few remains of a 12th century abbey survive (and the town council have plonked an ugly indoor swimming pool). It's also worth taking a look at the old part of Kenilworth on the hill beyond, which is a lot quainter than the main street. Entrance to the castle is across the Tiltyard, which would have provided passage above the Mere when all the adjacent fields were flooded for extra defence. After that you're into the main grassy courtyard, which is massive, with the main ruins up the slope to the left, and more resilient buildings to the right. The Tudor Stables are one of these, and contain an exhibition and the cafe. The Gatehouse is another, and also has an exhibition (with a more Elizabethan focus), plus your first spiral staircase to boot. The red sandstone Keep is massive, but is now a shell, and may have pigeons roosting on the upper levels. 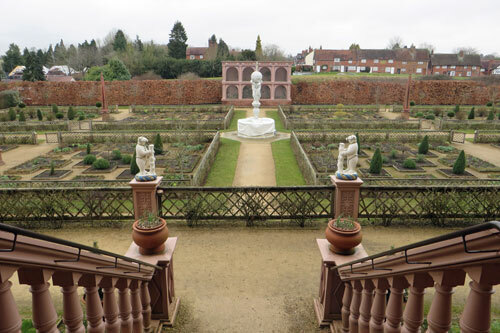 Step out front and there's an excellent view across the Elizabethan Gardens, or at least there is in summer. 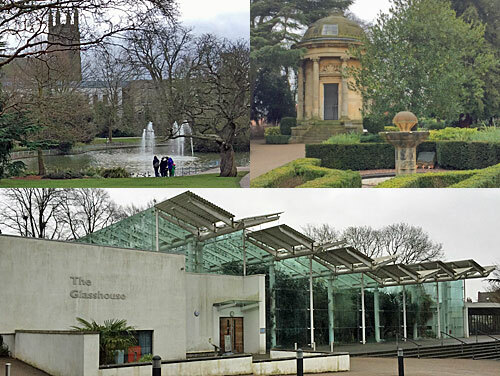 I looked at the gorgeous sunny photo on the take-round map, and tried to match that to the twiggy beds and wrapped-up fountain in front of me, but the geometry (and the bejewelled aviary) were impressive all the same. Behind the Great Hall, steps lead up the curtain wall, then up again. Here are the proper spiral staircases, tight and narrow and very much the original stone. As I climbed the slippery steps, my eyes getting used to the dark and trying not to put my hand down onto anything a bird had left, London's over-protective Hold The Handrail announcements seemed a million miles away. But the view from the very highest rampart was splendid, both across the Warwickshire countryside and looking inwards over the courtyard below. The other great bit to climb, using more 21st century steps, is the tower added to impress Queen Elizabeth I. 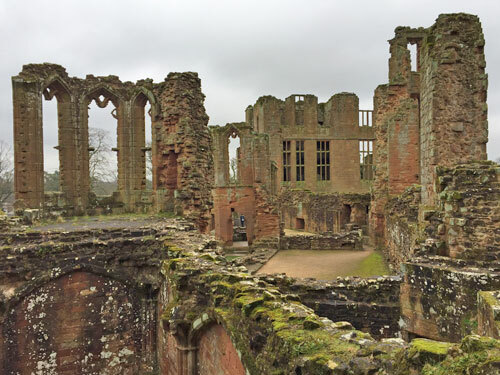 In 1575 she spent three weeks here on one of her royal progresses, as part of Sir Robert Dudley's plan to properly impress her. He threw banquets and dances and massed spectacles, and still the Queen wouldn't accept his hand in marriage, and heaven knows how English history would have been different if he'd been successful. But oh to able to stand in mid-air amid her private chambers, and to imagine what the full £1700 extravaganza might have looked like. 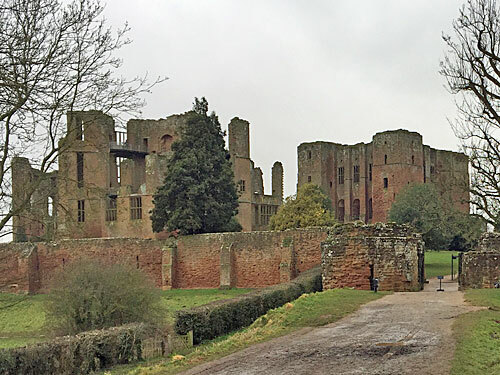 Kenilworth has a bit of something for everyone - deep history if you delve into the audio guide, plenty of nooks for the inquisitive to explore, ample running-around space for livelier kids, and gluten-free rolls with your soup. What there isn't are dungeon experiences, interactive towers and Costa coffee, but Warwick's only a four quid bus ride away for anyone so-minded. Hello Men Who Like Railways. This is Kenilworth station. It will be Britain's 2564th railway station. But it is not open yet. It closed the week before Winston Churchill died. It was supposed to reopen in December 2016. Then the date was pushed back to August 2017. Then the date was pushed back to December 2017. Then the date was pushed back to 18th February 2018. Then they said there'd be no trains on Sundays. This pushed the date back to 19th February. But it is not open yet. The car park is sealed off. The bus shelter is empty. The bench is empty. A white Transit van is parked in the taxi rank. Two parking spaces are barriered off. Men in helmets are looking over the barriers. 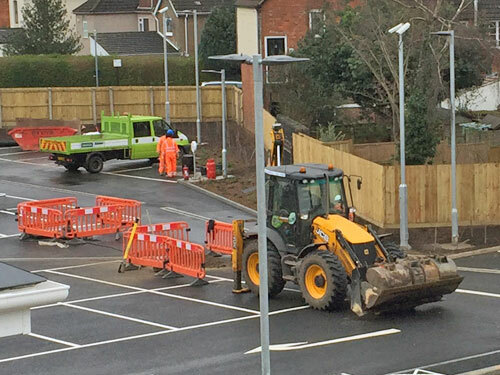 A JCB digger is punching the tarmac. Men with clip boards are walking around. An electrician's van is parked close by. The station is not open yet. 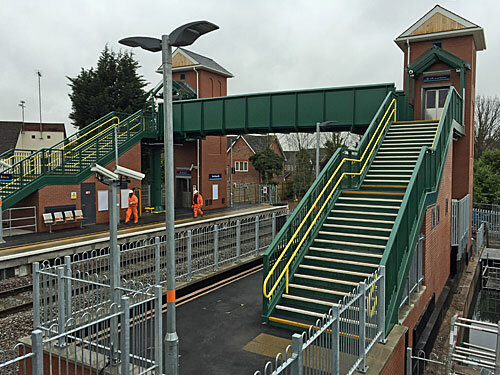 The footbridge over the station is open. You can go up and look down. The railway only has one track. The station only has one platform. It also has seats. The station building looks ready. The automatic doors are operational. Another new footbridge has been built across the track. It has lifts. The electronic displays are operational. But there are no passenger trains yet. 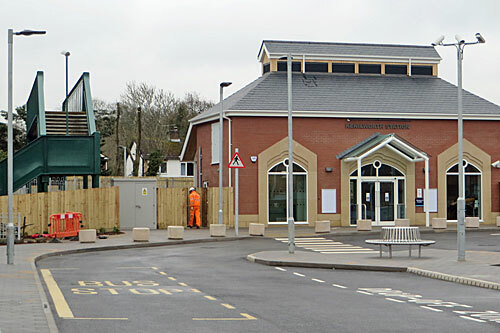 The station might open on 26th February. Or it might not be ready until 5th March. Or it might not even be ready then. Nobody is saying what the problem is. Nobody has admitted what the problem has been. There will be trains at Kenilworth station eventually. But it is not open yet. 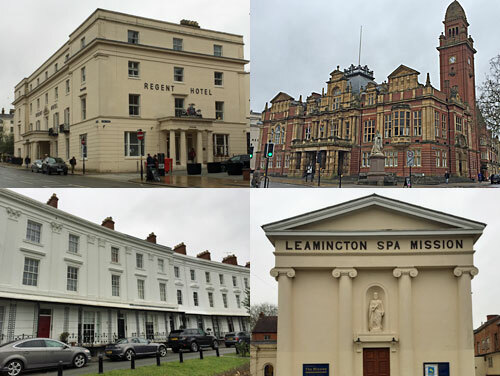 Leamington's game-changer was the Royal Pump Rooms, a pillared classical structure beside the River Leam, opened in 1814 for bathing and the taking of the waters. When spa-going fell out of fashion, a swimming pool and Turkish baths were added, which kept the place going until the 1980s. The local council then took over, repurposing the interior as the town's main library, plus museum and art gallery, cafe and Tourist Information Centre. I'm told the museum is fascinating. The museum is closed on Mondays. A drinking fountain outside allows passers-by to sample the waters, although I didn't see any passers-by ducking down for a salty gulp. A string of gardens were laid out beside the river for patients to "take the air", with the local population originally only allowed access first thing in the morning. 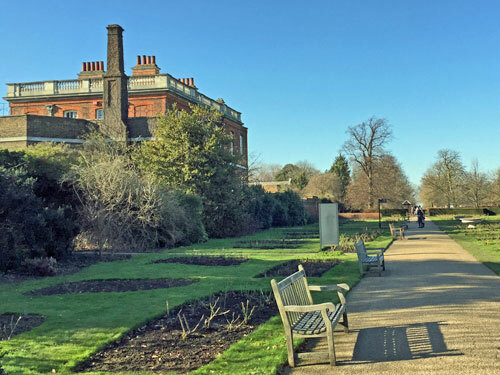 Jephson Gardens are still immaculately maintained, with pristine shrubbery, 72 different types of tree and, currently, carpets of crocuses and snowdrops. If you fancy a drink, the aviary has been repurposed as a cafe. If you want to know the time, the clocktower still bongs out the quarter hours. The most recent intrusion is a giant glasshouse for the display of subtropical plants, paid for with lottery cash, with a big wedding-friendly reception room tucked on at the back. Not only is it free, but also warm, and also open on a Monday. 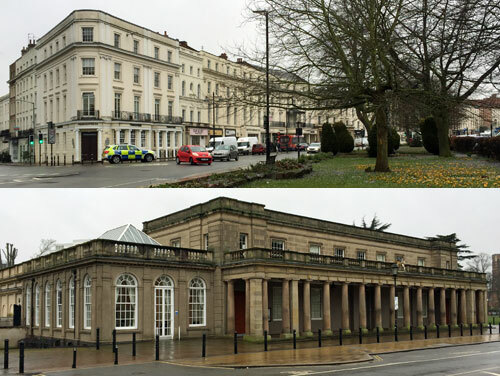 Royal Leamington Spa has by far the best shops in the area, always has, focused on a grid of streets to the north of the river. 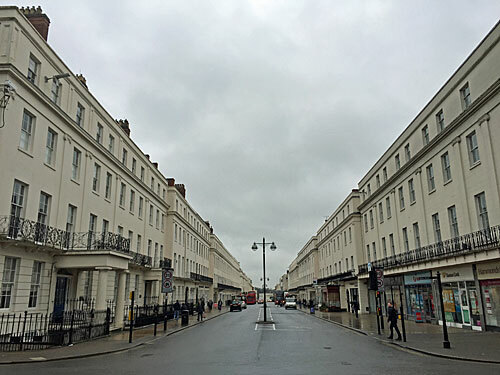 The main drag is simply called Parade, a grand thoroughfare rising from the Pump Rooms towards Christchurch Gardens, with a definite (but slightly modified) Regency vibe. Look carefully and a shopping mall is hidden behind the facade, with backstreets of independent boutiques tucked in beyond. At the foot of the hill is the Regent Hotel, where Queen Victoria once stayed as a child, for which ridiculously flimsy reason the town was allowed to add the title 'Royal' to its name. I doubt we'll see the current queen here any time soon, however, as it's now a Travelodge, with the downstairs converted into a Wagamama. So middle class is RLS that the first modern lawn tennis club was established here, and the bowling greens in Victoria Park are used for tournaments at international level. It's no coincidence that much of Keeping Up Appearances was filmed around here, whenever a town centre scene was required (although the Bucket residence was actually located in a suburb of Coventry). Hyacinths and Richards can still be seen in the streets, but also Onslows and Daisys, and a substantial Eastern European population has moved in since. Be sure to walk beyond the 19th century centre to see the real town, as well as enjoying its bourgeois heart. 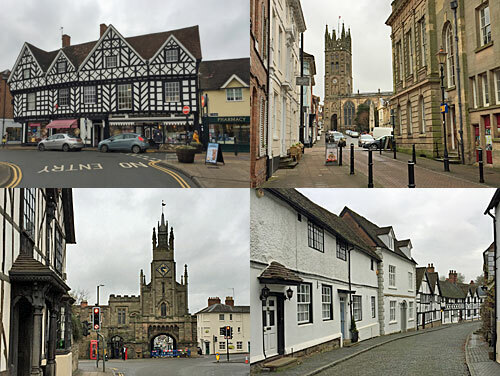 Warwick is the county town of Warwickshire, obviously, and can be found about 10 miles south of Coventry. It's an old town with a castle at its heart, hence on the pretty side, and there's plenty to see and do. 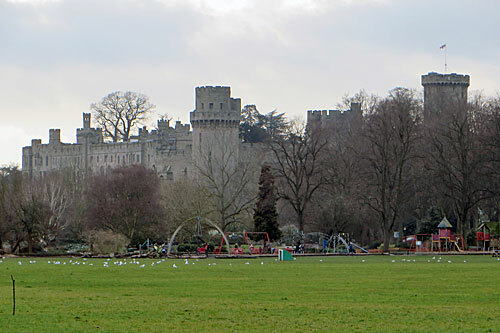 The big attraction is Warwick Castle, which covers a lot of land beside the River Avon, but is surprisingly hard to see from the town itself. For a 950-year-old it's in very good shape, and is one of Britain's most-visited castles, but a Monday in half term is probably not the best time to join the throng. Also, it's operated by the same company who run Madame Tussauds and Chessington World of Adventures, so it's all a bit "interactive immersive experience", so I wasn't keen. I did poke my nose in, only to be greeted by a sign saying Be Ready For An Exciting Day! Proud To Serve Costa, so I gave it a miss. Warwick has a lot of 17th century buildings because a fire in 1694 wiped out most of the medieval ones. The 17th century Market Hall in Market Place is now the town's museum. It's free, but unfortunately it's closed on Mondays. St John's House at the other end of the town centre is another museum, and is open daily... except in the winter, when it closes on Mondays. 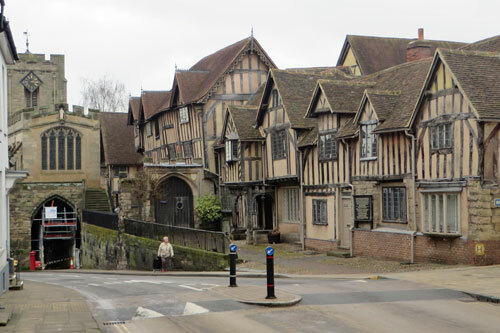 An impressive medieval survivor is the Lord Leycester Hospital (n.b. not, and has never been, a hospital), whose timbered frontage abuts a dip on the High Street. It's open six days a week, the one off-day being a Monday, so I didn't go there either. 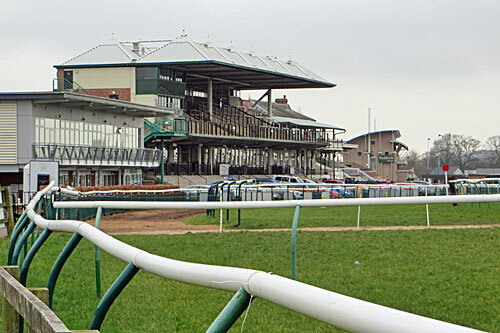 Warwick racecourse nudges up against the western edge of the town centre, at the bottom of a hill, with footpaths across the middle when no racing's scheduled. The next racing is scheduled for February 23rd, which is not a Monday. Overlooking the circuit is Hill Close Gardens, an extensive enclave of hedged terraced beds used by Victorians allotmenters with no outdoor planting space of their own. I'm sure they're gorgeous later in the year, but I wasn't tempted to pay £4.50 to see the snowdrops and a lot of bare earth. Also, although I made it down to the bottom of Mill Street round the back of the castle, the gardens there don't reopen until Easter. The Court House was open (even if the Warwickshire Yeomanry Museum on its upper floor wasn't). As well as a small display on the building's history, it doubles up as Warwick's Tourist Information Office, where the two ladies on duty were busy doing all the tasks they do to pass the time on quiet winter Mondays. The Warwick Visitor Guide leaflet is jolly useful. Another attraction which was actually open was St Mary's church, the town's tallest building, where if you ask nicely a lady will unlock the door to the tower and let you climb up to the roof. I didn't do that, but I did see a young couple being let in. People don't tend to like Mondays. There seem to be too many Mondays. But how many Mondays are there? I sometimes think the most powerful person in the history of the world is whoever it was decided there should be a holy day every seven days. They picked one particular day to be the very first day of the very first week, and that seven-day cycle has repeated ever since. Western civilisation operates to a specific weekly rhythm purely because that age-old historical figure started their sequence when they did. If you had a nice day off yesterday, but woke up this morning grumpy at having to go back to work, it's their fault. If we assume that the seven day week dates back to the ancient Babylonians, around 2350 BC, then there have been over 200000 Mondays altogether. The Romans decided to name the days of the week after heavenly bodies, initially informally, around the first century AD. One such day was diēs Sōlis, the day of the Sun, followed by diēs Lūnae, the day of the Moon. There have been just under 100000 'Moon' days since this reckoning began. The emperor Constantine made the seven-day week official in AD 321, since when there have been approximately 88500 Moon days. Around the turn of the first millennium, the Old English word for the "moon's day" was mōnandæg, which evolved to become monedæi. The final transition to Monday was complete sometime before 1200, which means there have been around 44000 Mondays since. The 20th century contained only 5217 Mondays. It was a cunning century, starting on a Tuesday and ending on a Sunday, so managed to avoid having 5218. But the 21st century will have 5218 Mondays (assuming we survive to the end). I too was cunning, and started my life on a Tuesday to avoid an extra Monday. But there have been 2762 of the blighters in my life so far, that's since 1965. I reached 1000 Mondays in 1984 (at the age of 19) and 2000 Mondays in 2003 (at the age of 38). You probably didn't reach those totals in the same year, but you will have reached them at the same age. That's not many, is it? That almost sounds countable. What a depressing thought, that you'll only see 4000 of the the most depressing day of the week. But to look at things differently, you'll also see 4000 Saturdays and 4000 Sundays, on average, which is twice as many. That's according to the government's latest life tables, which predict how many years the average man or woman still has to live, based on their current age. If you're 26 and averagely female you have 3000 Mondays left. If you're 42 and averagely male you have 2000 Mondays left. If you're 67 and female the number of Mondays you have left, on average, is still a four-digit number. I feel I don't want to dig any further into this. But not all of them. This year started on a Monday, and ends on a Monday, so manages to squeeze in 53. You'd expect this to happen once every seven years, but leap years can also have 53 Mondays if they start on a Sunday, so that's one extra every 28 years. Overall, 18% of years have 53 Mondays (boo!) and 82% have 52 (hurrah!). Some Mondays are bank holidays, and most people enjoy Bank Holiday Mondays a lot more than an ordinary Monday. In the UK there are always at least four Bank Holiday Mondays a year - Easter Monday, two in May and one in August - and sometimes as many as six. The first Monday in January is a bank holiday three years out of seven, thanks to the way we delay the public holiday if New Year falls at a weekend. Plus there's a Bank Holiday Monday at Christmas four years out of seven, so long as 25th, 26th, 27th or 28th December falls on a Monday. This is sounding better already. 2017 was great for Monday-haters, with the Christmas and New Year holidays both swallowing up a Monday. That left only 46 'working' Mondays, which is the least number possible. This happens in 21% of years, and will happen again in 2022 and 2023. However in 2018 New Year's Day hit Monday but Christmas won't, which makes 48 'working' Mondays, which is the greatest number possible. It's the same again next year, I'm afraid, indeed we get 48 'working' Mondays 43% of the time. We last had a Bank Holiday Monday seven weeks ago on New Year's Day, and we have another in six weeks time, on Easter Monday. Hang on in there, spring is coming. The shortest possible gap between Bank Holiday Mondays is one week, as often happens between Christmas and New Year, and very occasionally happens between Easter Monday and the May Day holiday (as in 2011). The longest possible gap between Bank Holiday Mondays is 34 weeks, between the August Bank Holiday and Easter Monday, and happens when Christmas falls on a Tuesday, Wednesday or Thursday and Easter is very late. This will next happen in six years time, between 26th August 2024 and 21st April 2025, so brace yourself. There will be four other bank holidays in that gap, of course, they just won't be on Mondays, so you may well have to go to work. As well as skipping work on Bank Holiday Mondays, your annual leave entitlement allows you to take other Mondays off. Take four weeks leave and that's another four Mondays gone, cutting the number of 'working' Mondays to 43 a year, on average. Use your leave entitlement creatively and you could take more Mondays off than any other day of the week, maybe even 28 Mondays off if you were feeling perverse, reducing the number to less than 20. Way to go! Before you started school, you probably had no concept of Mondays being the start of a working week. That's at least 200 Mondays you got through in your early years with no ill effects. Academic years are relatively short, too. A typical three-term year probably only includes 36-or-so Mondays, and fewer than that if your school arranged staff training days for Mondays, and fewer than that if you were educated privately. Throw in the long breaks that universities enjoy, and you may have endured only 600 'working' Mondays by the age of 20. Once going to work becomes a thing of the past, Mondays lose their downbeat image. Sometimes they're better than weekends because all the working people have disappeared and you can pootle round the shops in peace. Your retirement date may be a long way off, and getting further away rather than closer, but there should come a time when Mondays aren't so blue. Assuming a retirement age of 67, followed by an average lifespan, that's 1000 post-retirement Mondays which'll be no worse than any other day of the week. I've calculated this as follows. First, 600 'working' Mondays up to the age of 20 (see above). Then 43 'working' Mondays every year until the age of 67 (see above). And then no 'working' Mondays at all after that (see above), making a total of about 2600. You might be thinking "ah, but I expect to work past the age of 67", which'd nudge the number up. But equally I haven't included any sick days in my calculations (and sick days are usually Mondays), which'd nudge the total down. And 2600 Mondays out of a lifetime's total of 4000, well, that's only two-thirds of them. Perhaps Monday mornings aren't sounding quite so terrible after all. I can't make these figures be all about you, sorry. You might work part-time, second half of the week only. You might be long-term disabled, and every day is a struggle. You might be out of work, and the idea of a 'working' Monday might sound like bliss. You might do shift work, or zero-hours contracting, with an ever-changing pattern of employment which bears no relation whatsoever to anything I've been describing above. Monday gloom is meaningless when your life doesn't fit the age-old seven-day pattern. The working week has to start somewhere. It starts today, thanks to some anonymous Babylonian who fired the starting pistol a multiple of seven days ago.